To fuel Villard’s steamships and locomotives, a dependable coal supply was a high priority. By February 1881 the Oregon Improvement Company had acquired the Seattle Coal and Transportation Company, including the Newcastle Mine east of Lake Washington, at a cost of one million dollars. The Seattle and Walla Walla Railroad (renamed the Columbia and Puget Sound) was also purchased for over half a million dollars to transport coal from mine to Seattle bunkers. Villard hired John L. Howard under a five-year contract at $10,000 per year as general manager of the coal business. Villard also sponsored the Northern Transcontinental Survey, which was to determine the specific lands belonging to the railroads under the national land grants to locate any valuable assets on those lands, especially coal seams. Between 1881 and 1884 engineers employed under the survey discovered the valuable coal deposits of the Green River area, including the famed McKay vein at Green River Gorge. April 1882 found John Howard complaining of the poor quality and quantity of lignite coal from the Newcastle Mine and urging the development of the Green River coal field. One of the key challenges confronting the Oregon Improvement Company in exploiting the rich McKay vein on the Green River was accessibility. Howard proposed to build a 20-mile extension of the Columbia and Puget Sound Railroad from Renton Junction to reach the new site. He was highly enthusiastic and optimistic in 1882 when the so-called Cedar River Extension of the Columbia and Puget Sound was commenced and preliminary surveying and excavation work was under way at Green River Gorge. Henry Villard’s “grand design” seemed well on the way to reality. John Howard’s enthusiasm for the Franklin coal project was dampened, however, when Villard’s grand scheme collapsed at the end 1883 and the Oregon Improvement Company went through the agonies of receivership and reorganization. Overextension of resources, faulty construction cost estimates, failure to meet loan payments, and inability to pay dividends to stock subscribers were factors contributing to Villard’s decline. He suffered a nervous breakdown and retired to Germany to recuperate between 1884 and 1886. Out of the turmoil of reorganization, Elijah Smith emerged in April 1884 as president of the Oregon Improvement Company. He was confronted with the onerous task of trying to put the company on a paying basis. One of the stickiest matters was coal production, which included the vital detail of rail transport. Work on the Cedar River Extension came to a halt during the early months of 1884. Proposed financial support from such local agencies as the Seattle Chamber of Commerce and the newly formed Black Diamond Coal Company was not forthcoming. Many who had been charmed by Henry Villard’s optimistic dreams lost their enthusiasm for subsidizing the rail project now that he was no longer in charge. John Howard, however, remained undaunted by the reversals of early 1884. He revived commitments from local interests as well as the company’s board of directors. With Chinese laborers hired at 80 cents per man per day, the Cedar River Extension was completed in early 1885. By June of that year the first shipment of Franklin coal arrived at the Seattle bunkers. The first cargo of coal from Franklin reached San Francisco in early August 1885. It was only a token shipment of 96 tons, but to Howard it signaled the solution to the Oregon Improvement Company’s coal problems. The bituminous quality of Franklin coal was considered far superior to the lignite quality of Newcastle coal. Complaints of poor quality coal would now cease, it was hoped. Reliance on foreign coal (subject to import duties) to fulfill contracts would be greatly reduced, it was assumed. By the end of the year, total production of coal from the Franklin Mine was listed at 7,521 tons. The pressure to get full production from the Franklin Mine increased dramatically during 1886 and 1887. Howard pushed the mine superintendents unmercifully to extend shafts, drive gangways, install hoisting machinery, and construct housing, a store, and a boardinghouse. When James F. Jones, the first superintendent, proved inadequate, especially in dealing with labor problems, Howard replaced him with William J. Watkins, a calloused veteran who had been involved in combating the Molly McGuires (a secret organization of miners) in the Pennsylvania coal fields in the 1870s. 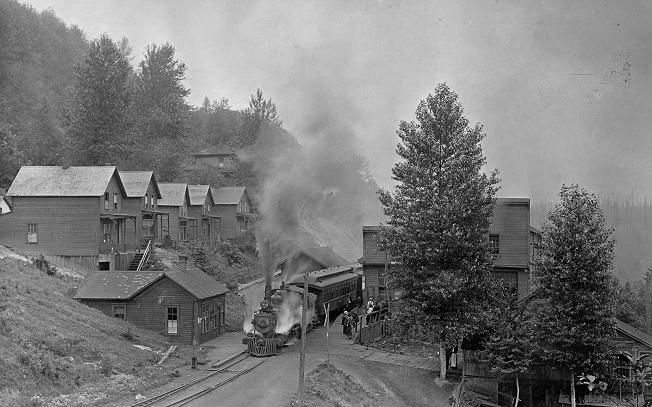 The months between June 1885 and December 1888 were probably the most active, productive, and optimistic in the 16-year history of Franklin as a company coal town under the Oregon Improvement Company. Although the expense of development outweighed the net income from coal production during these months, the anticipation of increased production and net profits for the future was reflected enthusiastically in John Howard’s letters. Elijah Smith’s perpetual pessimism regarding the coal industry was temporarily mollified, although he continued to complain of the red-ink reports from Franklin. Visitors to the newly built town in the summer of 1888 commented on the general air of progress and enthusiasm that prevailed among the miners, managers, workers, and their families. On December 11, 1888, disaster struck. Fire broke out in the lower level of the McKay vein. The men were called out of the mine and all available water power was brought to bear on the fire. All efforts proved useless. The mine had to be flooded. The greater portion of the mine lay idle for over two months. Preparations for sinking a new slope were begun. Two other discouraging events occurred during 1888 and 1889, striking blows to the Oregon Improvement Company’s welfare. Members of the Knights of Labor went on strike in May 1888, hampering mining activity in King County for several months. 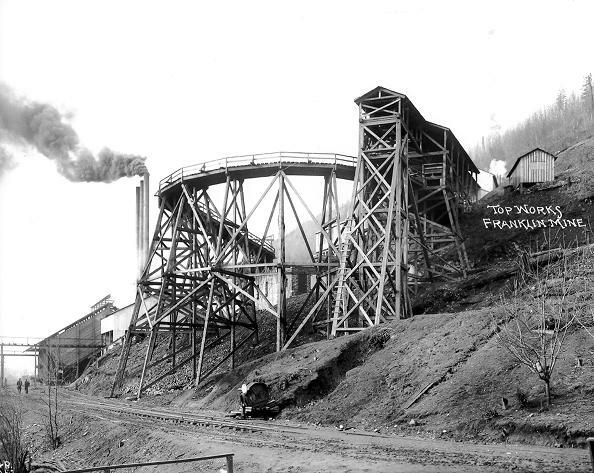 Franklin was marginally affected since most of its miners became idled by the fire and flood shutdown, but the strike added to the mine’s production woes. In June 1889 the conflagration at Seattle destroyed or damaged the OIC’s offices, coal bunkers, shipping piers, and rail equipment. Insurance covered only a fraction of the loss. Elijah Smith bemoaned the $204,000 needed to rectify the disaster. John Howard, with his usual enterprising optimism, viewed the incident as an opportunity to rebuild with an eye to modernization and increased efficiency. Management at Franklin underwent a change in early 1889 when William Watkins resigned as mine superintendent, replaced by Hobart W. McNeill. McNeill, who considered himself an expert on mine engineering and coal production, was faced with the unenviable situation of dealing with striking miners and a limping mining operation. He was responsible for completing the new slope at Franklin and dealing with strikers who, fortunately, returned to work in February. By then, though, the seller’s market that had prevailed in 1887 and 1888 was declining. In February 1890 mine operations at Franklin came to another standstill. Fire broke out in the new slope and could not be extinguished. Exploratory efforts on the south side of Green River had run into a fault that made operations there impractical. McNeill condemned the mine as “bad to the core,” suffering from a weak roof, highly pitched coal beds, and continuous fires and explosions. Elijah Smith speculated on searching for better mine fields as far away as Alaska, but bemoaned any added expense that might be involved. Up to this point, Franklin had never shown a net profit, and prospects for the future looked dim. Problems at Franklin were only part of the company’s woes in 1890. Lost coal contracts, reduced steamship earnings, risky railroad ventures, dejected stockholders, and company debts plagued the management, and reorganization seemed inevitable. In December the company again went into receivership. Elijah Smith’s tenure as president was over. The ensuing reshuffle brought William H. Starbuck to the presidency. Charles J. Smith became general manager, with offices in Seattle rather than Portland. John Howard remained as assistant manager in San Francisco. Thomas B. Corey replaced Hobart McNeill as superintendent of the mines at Franklin and Newcastle. With the coal market once more on the rise, the company weathered the storm of reorganization with renewed hope for better conditions to come. The Knights of Labor became active in Washington Territory coal fields in the early 1880s when they established a lodge at Newcastle. By 1885 they had organized the miners at Franklin and were involved in the expulsion of Chinese labor from the mines and other industries. Successful in their demands to oust the Chinese and gain a pay increase for the workers at Franklin, and bolstered by the economics of a seller’s market in the coal industry, the Knights had urged a miners’ strike against the Oregon Improvement Company in February 1886. The company took harsh measures to deal with the strike and seemed to have won when miners and workers returned to their jobs in May 1886 under conditions that were virtually unchanged. Labor problems, however, had continued to plague the company’s operations at Franklin and Newcastle and contributed to the demise of Elijah Smith’s leadership and the company’s reorganization in 1890. By spring 1889 the coal market was in serious decline, owing in part to large amounts of imported coal from British Columbia and Australia. The demoralized Knights of Labor retreated in disarray. For the time being, labor militancy was constrained by the economics of the coal business. The fundamental issues remained, however, and no procedures developed in the immediate future for negotiating them other than confrontation between miners and managers. A sliding scale of wages negotiated under a collective bargaining process might have solved the perpetual unrest generated by a sharply fluctuating coal market. As it was, every time a change in the wage scale became necessary, management resorted to threats of lockouts, blacklists, strike-breakers, and armed guards, while labor resorted to threats of strikes, violence, and implied sabotage. It was a losing situation that continued until progressive leadership evolved in both labor and management. The company’s coal business was given a boost by a strike in the Australian coal fields in September 1890. Pacific Northwest coal was in great demand at San Francisco. The response of the Knights of Labor was to demand higher wages in all of the operating mines, varying from 15 to 25 percent. C.J. Smith, the company’s new general manager at Seattle, recommended resistance to the demands and a “permanent and final ending” to such disputes by the installation of black miners in the company’s mines. For the time being, however, the company’s executive board acceded to the wage demands while considering plans for the importation of blacks to work at Franklin when the temporarily closed mine was reopened. Further demands by the Knights led to a showdown over an ironclad contract offered by T.B. Corey, the new mining superintendent in Seattle. When the Knights rejected the contract, C.J. Smith asserted that the only alternative was to import blacks. Corey withdrew the contract, resigned, and went east to recruit blacks in Illinois, Indiana, Iowa, and Missouri. Flyers issued in these states appealed to “colored coal miners” with enticements of steady work, good wages, and no strikes or trouble of any kind. On May 13, 1891, “The Black Train” departed from St. Paul with over 400 recruits, including women and children. The black miners and laborers had signed a three-year iron-clad contract for wages 15 to 25 percent lower than the Knights had been offered under the rejected contract. Union leaders in Seattle were now fully aware of the company’s scheme, which they vehemently denounced at a May 15 meeting. Early in the morning of Sunday, May 17, the train stopped at Palmer Junction. Armed with Winchester rifles, Thiel Agency detectives employed by the company escorted the black men, with their ancient Spencer carbines, on the three-mile hike to Franklin. They arrived there about six in the morning. Black women and children remained on the train, which took them to Seattle where they stayed until the situation at Franklin stabilized. The tenuous labor coalition soon fragmented. The blacks’ negative response to the pleas of the Knights and others was a setback for the strikers. The Knights and the WCLU quarreled over leadership and policy. The WCLU urged all white workers except those at Franklin and Newcastle to return to work. The Knights argued that white mine workers must stand together against employment of blacks. They met on June 13 and resolved not to return to work “unless all white miners are employed.” They now vented hostility toward the blacks while their attacks on the company abated. The mine managers watched the various groups quarreling among themselves and gloated. The company transferred 80 black miners from Franklin to Newcastle on June 28. Company tactics had again taken the miners by surprise, but the response was explosive. A confrontation between strikers and blacks at Franklin had resulted in injury to a black worker. Tension mounted as the train returned from Newcastle. Guards on the train began exchanging fire with armed strikers. Blacks at Franklin panicked and attacked the strikers. From their vantage point on the hillside they fired their carbines at cabins and buildings on the flat below. Over a thousand rounds were exchanged. Two strikers were killed and two white women seriously wounded. Governor Elisha Ferry promptly sent five National Guard companies into the area. Colonel J.C. Haines was ordered to disarm all sides. The Thiel guards were sent back to Portland, and the striking mine workers reluctantly surrendered their weapons. Tensions remained high at Franklin and Newcastle, but the National Guard was reduced to three companies, and superintendent Corey swore that all guns at Franklin had been surrendered. Coal shipments increased, and by July 27 C.J. Smith announced that the strike was over and wages would be reduced another 25 percent. The company seemed to have won a major victory in its struggle with the Knights of Labor despite the legacy of racial tension and workers’ resentment. All mine workers were forced to accept reduced wages and a no-strike guarantee. The sliding national economy brought further cuts in wages and seasonal layoffs between 1892 and 1895. The Knights rapidly disintegrated as a viable labor force after the 1891 strike. No comparable union force appeared in the coal fields until after the turn of the century. The Oregon Improvement Company’s victory over labor could not, however, resolve the ongoing difficulties of coal production. Bringing in black miners did not solve the problems created by poor planning, faulty engineering, high-pitched coal beds, and soft roofs in the mine shafts at Franklin. Fires and explosions ravaged the mine, production costs remained high, and the quality of coal did not improve. Ironically, C.J. Smith, who had worked so diligently to bring blacks to Franklin, came to blame them for keeping production costs high through their alleged inefficiency. By 1895 he was arbitrarily firing black miners and replacing them with non-union whites. As the company’s fortunes declined in the 1890s and it was being forced into receivership for its final demise, the triumph over the Knights of Labor seemed at most an empty victory. From the beginning the Franklin Mine suffered from inadequate engineering techniques to deal with the high-pitched coal beds. The traditional “pillar and room” system that was used successfully in eastern mines seemed inadequate to the conditions at Franklin. A long wall system introduced in 1891 was abandoned in 1893 as a failure because the coal produced was crushed to such a degree that it was largely unmarketable. 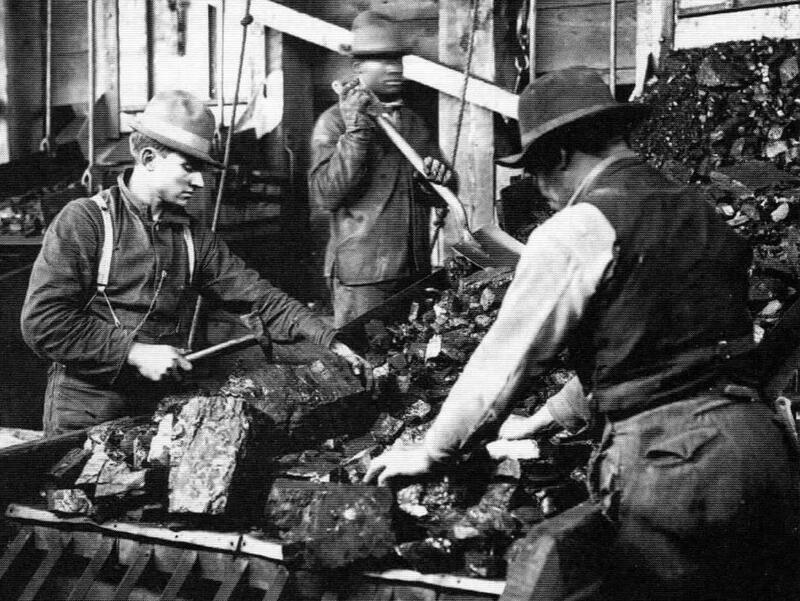 A return to the usual mining techniques in 1893 increased production at the Franklin Mine, but prices dropped due to the increasingly depressed general economy that followed the financial crash that year. The Gem Mine was opened in November about a half-mile down river on section 19, and the Number Seven Mine was opened on section 7, two miles north of the Franklin Mine. One of the most deplorable accidents that has ever occurred in the history of mining, by which thirty-seven persons lost their lives through suffocation by smoke from a … fire in the … [Franklin Mine], occurred on August 24th. The mine’s engineers had failed to provide for adequate egress, and the fan system, which might have dispersed the smothering smoke, failed at the crucial moment. Some suspected sabotage, but the evidence seemed to indicate faulty construction and negligence. Despite the enormity of this calamity, improper mining techniques at Franklin continued. The state mine inspector reported that the mine was poorly ventilated, especially in warm weather when the air current became weak. Another fire occurred on the morning of October 14, 1895, in the main slope of the Franklin Mine, in which four men lost their lives. News reports referred to the “unlucky mine” and implied that “something must be wrong.” The Franklin Mine was sealed up indefinitely. The Number Seven Mine had been closed down in November 1894 and allowed to fill up with water. With the exception of the small Gem Mine, employing only a handful of miners, coal operations at Franklin were suspended. The Oregon Improvement Company was about to experience its final death agony. … in reading the handwriting on the wall I can see that permanent good to us lies in the comprehensive scheme of buying, transporting, and selling oil. In 1895 speculations regarding oil were not realistic for the Oregon Improvement Company. It was passing into the hands of the receiver once again. The fate of the company was sealed when it was sold to the Pacific Coast Company in 1896. 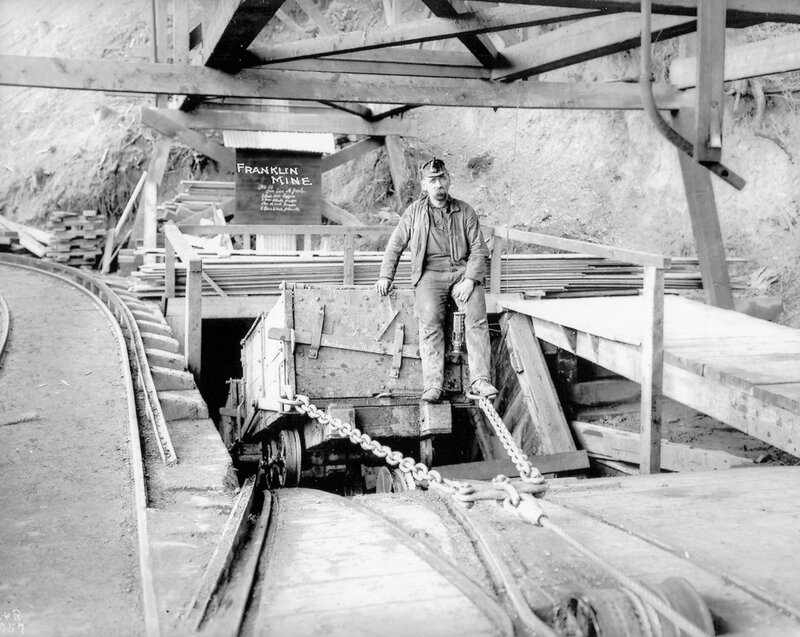 The mines at Franklin were reorganized and refurbished to the tune of about $300,000 and proved highly productive under able supervision and sound engineering from the turn of the century through World War I. 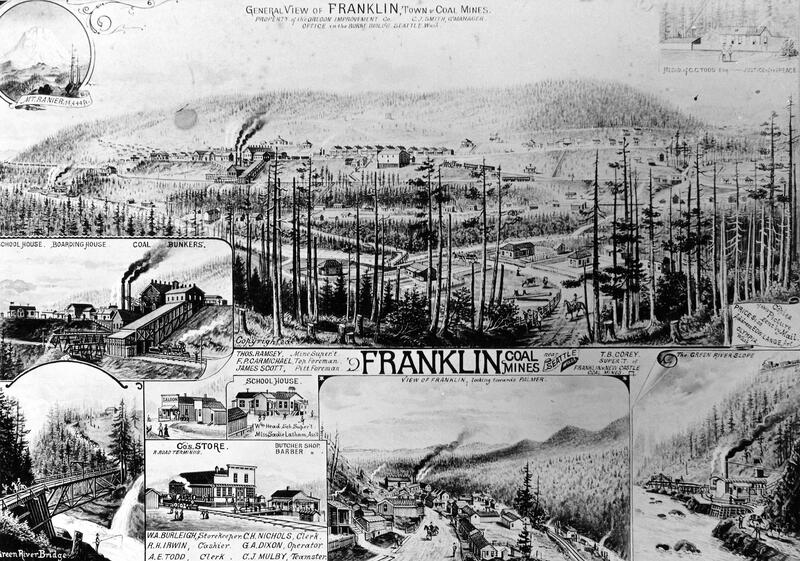 The original geologists’ report back in 1882 had stressed the need for skill and care in developing a mine at Franklin. A poorly selected man will undoubtedly make mistakes in the plan of this mine which cannot be remedied except at enormous expense, and which will handicap the property with a heavy additional cost of production. The managers and coal superintendents of the Oregon Improvement Company seemed to have labored mightily for 16 years to fulfill this prophecy. John Hanscom is a retired teacher of history at Green River Community College and has done extensive research on the history of mining operations in the Franklin community. Special thanks to Gerald Hedlund, anthropology instructor at Green River Community College; Mark Vernon, archaeology specialist; and Don Mason and the Black Diamond Historical Society for making available to me a wealth of research sources and materials.